Enjoy 100% organic cotton delivered straight to your door! With our convenient subscription model, you’ll never run out of tampons or pay a premium for synthetic tampons. Enjoy a three-month, six-month or one year supply delivered straight to your door on a schedule you choose.  We’ve pledged 15% of our sales in the form of organic cotton tampons delivered straight to our partners. We partner with the Trussell Trust, the UK’s biggest foodbank charity which runs more than 250 strong network of foodbanks across the United Kingdom, and few homeless shelters in Essex, as well as Days for Girls — an international not for profit serving girls around the world with education, advocacy and sustainable feminine hygiene. Help Yourself. Help the environment. Help a woman in need. Organic Brands Limited, the Natural Choice. 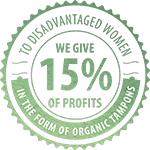 Women all across the UK are choosing 100% organic cotton tampons for their bodies, the environment and social good. Subscribe now and join them today! Did you know that tampon companies are not required by law to list the ingredients on their packaging? Or that synthetic tampons contain the dangerous chemical, dioxin, which puts women at risk for TSS and vulvitis? Even in trace amounts, dioxin is dangerous because of its cumulative effects: the average woman will use more than 11,000 tampons in her lifetime! Traditional tampons also contain synthetic fibers like viscose and rayon, chlorine, pesticides, toxins, bleaching agents, fragrances and wood fluff pulp. Not only are organic tampons better for your body, the chemical- and pesticide-free cotton used in organic tampons has a ripple effect on the rest of the environment. Name, mobile and e-mail address will be used in orders.